Thomas Henry Huxley, used it as evidence for the new theory: here was an animal with a long bony tail, a hand with three separate clawed fingers with claws and toothy jaws (all primitive reptilian characters), but also asymmetric feathers, a furcula (the fused clavicles, or 'wishbone') and wings (all advanced bird characters). Archaeopteryx has continued to attract attention since then as it is seen as a focal animal in evolution: creationists attempt to argue that it is either a true bird with no hint of intermediate characters, and hence not part of an evolutionary transition series, or that it is a forgery. In both views they are mistaken. Eight skeletons of Archaeopteryx are now known, as well as a single feather impression (Figure 9.1), all collected from the Upper Jurassic limestones of Solnhofen, Bavaria. The first specimen to be found, a single feather (Figure 9.1(a)), was collected in 1860, and the first skeleton with clear feather impressions, the London specimen (Figure 9.1(b)), was named Archaeopteryx lithographica in 1861. 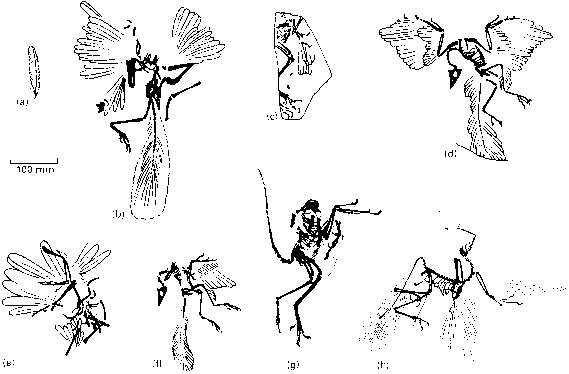 The most famous example, the Berlin specimen (Figure 9.1(d)), was found in 1877. It is a virtually complete skeleton, with the limbs and head in articulation and the feathers of the wing and tail well preserved. Six more skeletons were collected in 1855 (recognized 1970), 1951, 1956, 1987, 1992 and 1997. The history and anatomy of these specimens are described by Elzanowski (2002) and several detailed monographs on their anatomy have been published (e.g.Wellnhofer, 1974,1988b, 1993; Ostrom, 1976). subsequently made a case that the seventh (Munich) specimen is a distinctive small species, Archaeopteryx bavarica,because it was clearly an adult as it has an ossified sternum. It differs also in having longer tibia bones and longer legs than A. lithographica. Elzanowski (2001) assigned the sixth (Solnhofen) specimen to a new genus and species, Wellnhoferia grandis, on the basis ofits large size and differences in the numbers and proportions ofbones ofthe hand and foot, and its short tail. It is unclear whether these additional species and genera will be accepted and in the following I refer to all the Solnhofen bird specimens as Archaeopteryx. The skeletons of Archaeopteryx were found at different levels in the upper Solnhofen Lithographic Limestone (Obere Solnhofener Schiefer), a fine sediment consisting of alternating layers of pure limestone and marly limestone containing clay. The pure limestones were quarried for the manufacture of printing blocks, hence their description as lithographic limestones. The limestones were deposited in a subtropical lagoon and the fossils include marine or brackish-water forms (plankton,jellyfish, ammonites, crinoids, starfish, crustaceans, fishes), as well as terrestrial plant remains, insects, pterosaurs, crocodilians, sphenodontians, rare dinosaurs (Compsognathus) and Archaeopteryx. The carcasses of Archaeopteryx appear to have drifted for some time at the surface, buoyed up by the gases of decomposition. Eventually, the guts burst and the carcasses sank rapidly to the bottom, where they were moved around before reaching their final resting place. Most specimens lie on their sides with all limbs and other elements in articulation. The neck is always bent firmly back as a result of the contraction of strong muscles and ligaments during preservation. Archaeopteryx is a medium-sized bird, 300-500 mm long from the tip of its snout to the end of its tail (Figure 9.2(a)), and it may have stood about 250 mm tall, about the size of a common magpie. The skull (Figure 9.2(b, c)) is lightly built, and it may have been kinetic, with a movable quadrate (streptostyly), a bird feature paralleling that seen in lizards (see pp. 239-40). It is not certain whether the skull of Archaeopteryx was as kinetic as that of living birds, which can also move their beaks up and down relative to the rest of the skull (prokinesis or rhynchokinesis). The lower jaw is narrow and robust, and both jaws bear several small widely-spaced sharp teeth set in sockets. The teeth show some derived and some primitive features. As in later birds, the teeth do not have serrated edges, a feature of theropods and other archosaurs, and there is a constriction between the root and the crown of the tooth. The seventh (Munich) specimen shows that Archaeopteryx had interdental plates (Figure 9.2(d)), bony projections on the inside of the jaw that extend up between the teeth, a feature shared with theropods and basal archosaurs, but absent in later birds (Wellnhofer, 1993; Elzanowski and Wellnhofer, 1996). Archaeopteryx had large eyes and a bird-like brain with large optic lobes, which indicates that sight was a key sensory system. Archaeopteryx has an S-curved neck, like theropod dinosaurs, a short back and a long straight tail with 21-22 caudal vertebrae. There were air spaces inside the cervical and thoracic vertebrae, as well as in the pubis, indicating the presence of at least two of the five air sacs found in modern birds (Christiansen and Bonde, 2000). The shoulder girdle is lightly built, with a long narrow scapular blade and a short subrectangular cora-coid. Until the discovery of the seventh (Munich) skeleton, an ossified sternum, typical of later birds, had not been identified in Archaeopteryx,but the new specimen shows a broad plate-like element linking the two cora-coids in the midline (Wellnhofer, 1993). There are three fingers on the hand and these are greatly elongated and bear long curved claws. The pelvis is theropodan, but there has been some controversy over its reconstruction and in particular over the orientation of the pubis, which may have run essentially vertically, as in some theropods, or backwards as in living birds. The new specimens confirm the first view (Figure 9.2(e)). 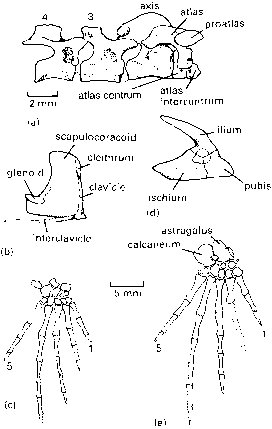 The hindlimb (Figure 9.2(f)) is also like that of small theropods: the femur is short and slightly arched, the tibia is straight and the fibula very thin, the astragalus and calcaneum are firmly attached to the ends of the tibia and fibula, there appears to be an ascending process associated with the astragalus, the outer (5) toe is virtually lost and the inner (1) toe is short and lies at the rear of the foot, the reflexed hallux typical of many birds. The foot could be used for climbing tree trunks, based on comparisons of the toes and claws of Archaeopteryx with living birds, whereas the hindlimbs and pelvis are built for moving about on the ground (Elzanowski, 2002). The specimens of Archaeopteryx are famous for preservation of soft(ish) tissues. All the claw bones of the hands and feet bear horn (keratin) sheaths that extend the claw length considerably. There is no trace of a horny beak. The feathers (also made from keratin, see pp. 199-200) show considerable detail. There are short contour feathers over the lower neck, body, base of the tail and legs. The wings look surprisingly modern, with 11 or 12 primary flight feathers attached to the hand and at least 12 secondaries attached to the ulna. The bases of the quills of these flight feathers were covered with three rows of covert feathers, as in modern birds. The 16-17 pairs of tail feathers attach to the caudal vertebrae, one per vertebra, from the sixth caudal back. There have been endless debates about the relationships of Archaeopteryx over the years. It is generally accepted that Archaeopteryx is the oldest known bird; older records of supposed birds from earlier in the Jurassic, and most notably Protoavis from the Late Triassic (Chatterjee, 1991), have been rejected as inconclusive (Witmer, 2002). Archaeopteryx is a form with a mixture of characters intermediate between reptiles and birds, the classic example of a 'missing link'. Palaeontologists have disagreed strongly, however, on the closest reptilian relatives of birds, and this has led to three very different models of bird origins. 1 The mammal-bird hypothesis. Birds and mammals are endothermic, both groups have four-chambered hearts, advanced brains and insulating skin coverings (feathers and hair) made from the protein keratin. Gardiner (1982) enumerated these and further supposed shared characters to support his view that, among living animals, birds are not archosaurs, or even diapsids, but the closest living sister group to the mammals. In addition, some evidence from blood proteins shows a pairing of birds and mammals as sister groups. There is little morphological evidence for such a view, however, especially when fossil taxa are included in the analysis (Gauthier et al., 1988b; Benton, 1990c), and current molecular evidence (e.g. Hedges and Poling, 1999; Zardoya and Meyer, 2001a) favours the traditional view. 2 The basal diapsid-bird hypothesis. A vocal minority argue the case that birds evolved in the Triassic from a diapsid or archosaur ancestor. Their choice of ancestor has varied considerably, from Late Triassic crocodilomorphs (see p. 145), a basal archosaur such as Euparkeria (see p. 141), the basal ornithodiran Sclero-mochlus (see p. 153), the long-limbed prolacertiform Megalancosaurus (Feduccia, 1999a), or the crested diapsid Longisquama (Jones et al., 2000). The anatomical evidence for all these suggestions has been shown to be spurious, and the supporters of this view are charac terized as presenting 'an argument of opposition rather than an argument of advocacy' (Witmer, 2002); in other words, they know they are against the dinosaur-bird hypothesis and so seek to pick holes in it, but they do not have an alternative phylogenetic view of their own. 3 The dinosaur-bird hypothesis. Ostrom (1976) catalogued dozens of similarities between the skull and skeleton of Archaeopteryx and those of derived thero-pod dinosaurs such as Deinonychus.Subsequent cladis-tic analyses (e.g. Gauthier, 1986; Holtz, 1994; Sereno, 1999, 2001; Chiappe, 2002b; Clark et al., 2002) have fully supported this view and establish beyond all reasonable doubt that the birds are derived theropod dinosaurs, related closely to the dromaeosaurids or the deinonychosaurs (see Box 8.5). The debate on bird origins has sometimes confused function and evolution. Proponents of the basal diapsid origin of birds are mainly supporters of the arboreal hypothesis, that flight originated from climbing ancestors ('trees down'), and they regard the dinosaur-bird hypothesis of relationships as necessitating a cursorial origin of flight ('ground up'; see section 9.2). There is, however, no such necessary linkage between the origin of flight and the origin of birds, and an argument for the arboreal functional hypothesis does not reject the bird-theropod phylogenetic hypothesis (Witmer, 2002). Logically, phylogeny must come first and phylo-genies must be supported by character data. The debate has been unnaturally prolonged by media attention. The origin of birds has been a topic of great public interest for the past twenty years, so much so that the leading proponents are frequently interviewed for newspaper articles and TV specials. The rules of journalism require that 'equal time' is given to representatives of each viewpoint. So the supporters of the basal diapsid origin of birds often have as much airtime as the supporters of birds as dinosaurs, even though the latter represent probably more than 99% of working vertebrate palaeontologists.